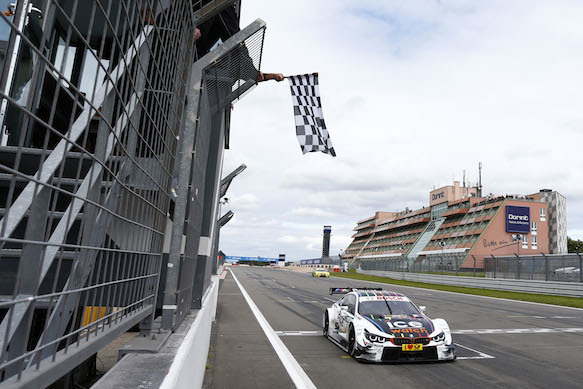 Marco Wittmann put one hand firmly on the DTM championship trophy with victory at the Nurburgring. The RMG BMW driver barely put a foot wrong all afternoon in his heavily success-ballasted M4, making a perfect start and leading all bar one lap - the one during which he made his mandatory stop - on his way to his fourth win of the season. With Mattias Ekstrom retiring after the first lap with mechanical problems, Wittmann now has a whopping 64-point lead over the Swede, with just 75 points on offer across the remaining three races of the year. "The race was pretty good," he said. "I had a good start, and good opening laps where I could make a gap. At the end of the race I was a bit under pressure - I was struggling a bit with the prime tyres. But overall it was a great weekend for us." 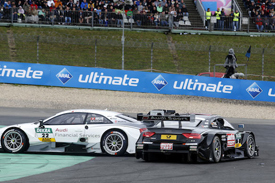 Mike Rockenfeller finished second, his race-defining move coming at the start when he jumped Audi team-mate Edoardo Mortara on the run to the first corner. From there, he was able to shadow Wittmann, even making the leader sweat by closing the gap to beat him into the DRS window with a couple of laps remaining. But in the end, he fell 1.2 seconds short of taking Audi's first win of the season. "We did a good job," Rockenfeller said. "I got the maximum out of my car, and still I wasn't able to win. That's a bit frustrating, of course. Five more laps it would have been a but more exciting. In total, I'm happy to be back." Mortara came home third, having spent the entire race with mirrors full of Paul di Resta's Mercedes. Di Resta, who finished fourth, put in a solid drive to make spots early, particularly his move on team-mate Daniel Juncadella as the pair squabbled over fourth in the first stint. Juncadella finished fifth, while Christian Vietoris made it a Mercedes 4-5-6 with a solid move on BMW's Maxime Martin at Turn 1 on lap 33. Martin went on to finish seventh. Martin Tomczyk was the best of the drivers to use the hards-to-soft strategy, going from 18th to eighth. The BMW driver had an excellent first stint, establishing himself as the frontrunner of those on that strategy. But, without a safety car in the second stint, the best he could manage was eighth, ahead of Mercedes drivers Robert Wickens and Pascal Wehrlein, who also started on the standard tyres. Timo Scheider might have been in a position to fight for a podium, having looked strong on the harder tyres in the opening laps, but a lap eight clash with Audi team-mate Nico Muller (pictured) left him out of the race. Still, he got further than Miguel Molina. Starting sixth, the Spaniard only made it to the end of lap two after first-lap contact left his RS5 too damaged to continue.